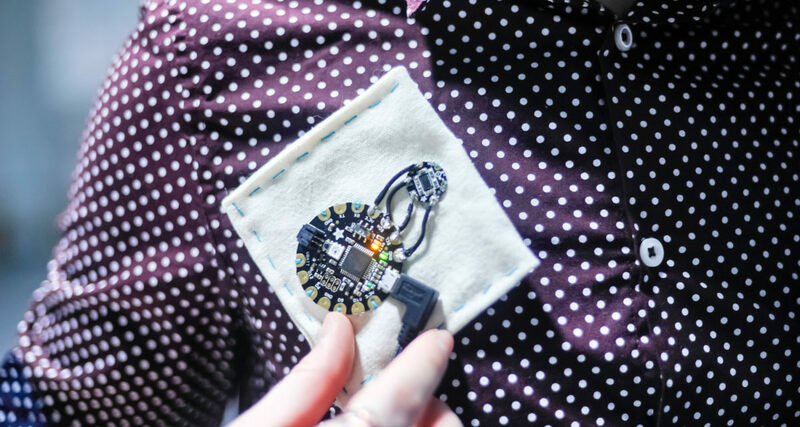 Play with inexpensive, coin-sized sensors which can be sewn into costumes with conductive thread. Participants will get hands-on experience with demo circuits that use position, acceleration, light exposure, microphones, and touch sensors to control a variety of outputs like LED lights, sound elements, and video. Participants will receive a list of links to all equipment used as well as sample code from all demo projects shown during the class. Keira Heu-Jwyn Chang was a triple-major in Ballet, Astrophysics, and Philosophy at the University of Utah before pursuing Cultural and Arts Management at American University. Chang worked at the Association of Performing Arts Presenters and New York City Center Theater. She spent two years with a small venture capital firm gaining fluency in financial and business planning, investment, and securities regulation. She currently serves as Executive Director of the stellar Kate Weare Company. Chang continues to pursue projects at the intersection of technology and the arts as a freelance photographer, graphic designer, web developer, electronics fabricator and interactive installation designer. Her newest venture, DADA – The Dance Arts Data App, is a web based application designed to be a free tool and a knowledge base of fundraising, marketing and administrative information for dance organizations. Photo by Keira Heu-Jwyn Chang.